When it comes to upgrading your ball bearings the Ceramic silicon nitride ball bearing is the ultimate choice for those wanting the very best in their AEG. Not only is the Ceramic ball bearings lighter and faster than it’s steel counter part, but with a smoother surface it gives off less friction and heat build up. This reduction in thermal signature aides in avoiding costly breakdowns in upgraded gearboxes. Lighter. The ceramic ball is lighter then the steel ball. This means that the ball exerts less force outward against the outer race grove as the bearing spins. This reduction in outward force reduces the friction and rolling resistance which greatly reduces heat build up. Harder. The ceramic ball is harder then the steel ball. This gives you a bearing that will last up to 10 times longer then the steel ball bearing because it holds its finish better. 7 balls has been chosen which offers less centrifugal force from each ball compared to bigger 6 ball version = less heat and track wear in high speed conditions. Smoother. The ceramic ball has smoother surface properties then the steel ball. This means less friction between the ball and bearing races giving you a faster spinning bearing and less heat buildup. Thermal. The ceramic ball has better thermal properties then the steel ball. Thermal expansion is only a third of steel balls thus also reducing the heat build up. Lubrication. The ceramic balls are impervious to oxidation, chemicals, and require essentially no lubricant. 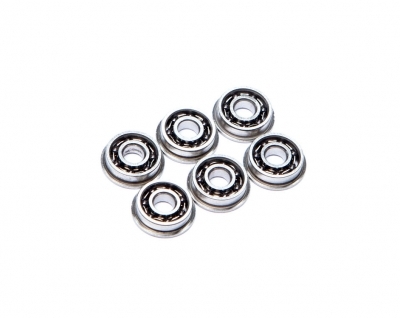 The bearings are lubricated with a very small amount of oil, not a gel or grease.